Can you believe how much sugar has been in the news lately? Between Mayor Bloomberg’s soda embargo and HBO’s high profile documentary on obesity in the US, not to mention the new statistics coming out weekly pronouncing sugar responsible for everything from hemorrhoids to hammer toes (Sugar makes you fat! Sugar makes you stupid! Sugar makes you really, really annoying at parties!) it seems to me a wonder that we all haven’t started treating the stuff like rat poison rather than our favorite ingredient for summer fun. But it is our favorite ingredient for summer fun (and spring, fall, and winter fun) and it all goes to show how terribly addicted we all are- both biologically and socially- to this ingredient which has been proven comparable to cocaine in the effects it has on our brain. As I’ve alluded to in prior posts, ever since our family’s official Year of No Sugar concluded, I’ve been living the strange life of a reformed addict… like the alcoholic who is convinced they can drink “occasionally,” or the rare person who can smoke the “once-in-a-while” cigarette without getting hooked. Can one have “just a little” sugar? The slope is sooooooo slippery that I continue to be unsure. I’ll give you a for instance: a few days ago, I took our two girls strawberry picking. I was in a panic because strawberries have had a rough year- what berries there are have almost been picked out of our area farms already. For a good hour the kids ran up and down the rows exclaiming over especially big or funny-shaped examples… it was like a perishable treasure hunt. In our enthusiasm we picked two full flats- a good $45 worth of the pretty little orbs. It was a great fun. Once we got them home, however, I was forced to contemplate what on earth we would, in fact, do with all of them. Sure, we’d eat a lot of them plain, or sliced on our cereal and oatmeal. But what else? In the past I would’ve made a host of pies, breads, scones and muffins. With the remainder I would’ve made steaming pots of strawberry jam. In short: sugar, sugar, and LOTS of sugar. This year…? In the midst of my sugar identity crisis I’m paralyzed by indecision- and thus the strawberries sit undisturbed, taking up a ridiculous portion of our fridge, and not getting any younger, mind you. I’d like to pick up where I left off last year experimenting with some no-sugar jams using Pomona pectin, or maybe attempting some no-sugar freezer jams/fruit spreads… but these things take time and patience. These days those things are in short supply as I’m frantically packing our older daughter up for her first-ever week of sleep-away camp and (by the way) trying to finish this little book I’ve been working on entitled A Year of No Sugar (remind me to tell you about it sometime…) so here’s my Official Prediction: in a panic at the eleventh hour I’ll wash and freeze the lot of them, discarding a depressing amount that have already shriveled while I was having my extended Hamlet moment of indecision (To bake? Or not to bake? That is the question…). Meanwhile, summer rolls onward and sugar pops up on a regular basis to say “Boo!” In the last week our family has celebrated a graduation, a birthday, our anniversary, and Father’s Day not to mention the arrival of the local carnival and, of course, summer itself. Even without this celebratory traffic-jam, a day doesn’t go by when I don’t confront the Sugar Question: lemonade at the farmer’s market? Cotton candy at the fair? Chocolate buckeyes by the register at the local sandwich counter? Ice cream? Ice cream? Ice cream? Is it good enough that we don’t drink soda (now in garbage pail size! ), don’t buy candy bars (still legal! ), don’t buy processed or added sugar foods (now, with more ingredients than ever!!)? Maybe. It’s something I struggle with every day while the world keeps spinning around me, largely oblivious, despite the increasingly scary statistics and revelations. Even if the bucket soda ban and the HBO series aren’t perfect, and of course they aren’t, they’re terribly important by virtue of the fact that they’re trying to begin the conversation. They’re sending up the first real flares that something is amiss- that we need to take a cold hard look at what people consider “food” and what its doing to our bodies as a result. 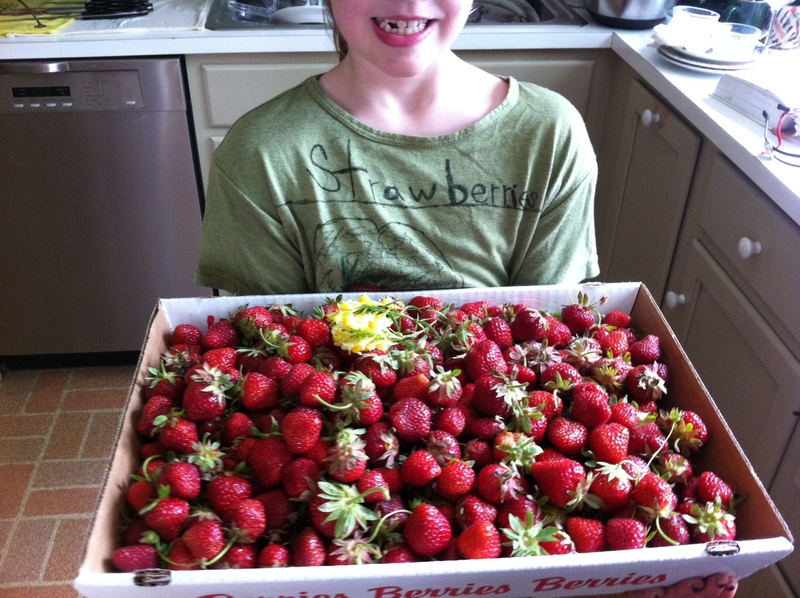 Meanwhile, I’m back to the drawing board on another important problem: my strawberry surplus. Anybody have a good recipe for strawberry soup? How about bake with some of them and put the results in the freezer to spread out over the 11 months when there are no fresh wonderful strawberries? They’d be great in a cake or pie on Thanksgiving or in rolls for Christmas breakfast. Also, I’m no expert on smoothies, but you could probably concoct something with non-fat (or 2% fat) yogurt for these hot summer days. I’m still trying for moderation in all things-a hard enough task without trying to eliminate all sugar/fat/salt or whatever. My hat goes off to you! Hope you reach a satisfying conclusion. Have you thought of homemade strawberry popsicles? You just put some strawberries in the blender, add a little lemon juice (this could be considered sugar) and some milk. Then fill up the ice cube trays. Enjoy your strawberries. I am going to try this!! Sounds good, easy & very refreshing. this point it was due to these factors that I chose not to exclude lemon juice from our cooking in our Year of No Sugar- (which I wrote about in Post #41: https://eveschaub.com/2011/04/15/a-year-of-no-sugar-post-41/). The link worked, and was really interesting. I use lemon juice when I am cooking all the time. I agree that it is sometimes hard to know what “counts” and what doesn’t. With lemon juice I just think it adds a lot of flavor and not too much fructose. I am also having the same difficulty with ice cream this summer as you seem to be having. If it is homemade, or local, or with homemade chocolate sauce, does it really count? I wonder if you could make a strawberry version? I’m not particularly adept at modifying recipes, but I’ve not got a lot of cooking experience — I imagine you’d be a lot better at figuring out a strawberry version! I totally feel your dilemma. Funnily enough I AM the ex-smoker who can have a cigarette about once a year without getting hooked again, which is nice. But not so with sugar — any kind of refined sugar in anything and I fall down a very slippery slope, very fast. I believe that there ARE some people who can do the once-in-a-while thing, and they are very lucky people, but I think they’re also kind of rare. For the rest of us, it’s Constant Vigilance. You really do make the BEST comments! In particular thank you for pointing out the problem I have with comments pending moderation- I am very VERY bad about this and your reminder is very much appreciated. Thanks again for your reiteration- as you can probably tell, getting a chance to write a new blog has been much harder while working on the book, and it means so much when I get a note of encouragement like yours- again, THANK YOU! P.S. I’ve noticed sometimes my comments with links seem to require moderation and sometimes seem to slip under your radar — hope that’s not the case with the one I just posted! First I make a 2 millimeter thick jelly by boiling up 500 grams of strawberries with dextrose to taste. Then I sieve out the pips. Add app. a dessertspoon of powdered gelatine to the remaining juice and pour it into a pie dish the same size as the cheese cake. I line the pie dish with a circle of greased greaseproof paper for easy removal. When it’s set I tip it carefully on to the cooled cheesecake to fit the top and peel off the greaseproof paper. I then decorate the top with halved strawberries. That sounds lovely- I’m looking forward to making this one!! Thank you. I would just puree and freeze in ice cube trays, then pop them out and store in a freezer bag or whatever is your storage choice. Then use them in smoothies, or thaw to add sweetness to homemade vinegarette. or use instead of syrup or even spread on toast. Or you could make fruit leather. Or what about freezing the puree in a ice cream maker to have slushies….or add some rum for rum slushies! 🙂 What about ice cream with something like cream, milk, yolks, vanilla, strawberries and a tiny bit of stevia? or strawberry salsa and eat with some homemade chips sprinkled w/ cinnamon. one of my favorite salads is spinach w. strawberries, feta and pecans and maybe grilled chicken if you need it to be a meal. I’ve never tried grilling strawberries…..maybe you could skewer them and grill for a min. and drizzle w/ balsamic vinegar. Strawberry salsa!! I love this idea! Also the spinach and strawberry salad sounds wonderful- this is a great list of ideas. I have my work cut out for me…. Wow, I can’t believe I reached the end of your posts! Ive been reading for about four days now. Thank you for sharing your family’s journey with us. I wanted to do the same thing this January but I only made it February… You’ve renewed my determination. Another family we know has also been following that same doctor’s advice on sugar. My friend regularly tells me how increasing the fat in our diets actually makes us full faster and therefore we eat less. I’m already thinking about and talking with my family about cutting out unnecessary sugar and sugar treats unless it’s a birthday or a holiday. One of the biggest downfalls in our diets is the abundance of donuts and treats at church both before and after service and the abundance of little old ladies who hand them to my children!! I want to put up a sign that says “please don’t feed the bears” with a picture of the kids in costume! Lol! Exactly my reaction! SIGH. Sounds awfully familiar- not just the well meaning little old ladies but the crossed signals even within the “unified front” of the family. Summer’s been especially hard this year since “special” summer treats abound (ice cream! S’mores! strawberry shortcake!) and we’re no longer held hostage to our official “mommy’s writing about it” year. I’m especially delighted and gratified to hear you read them straight through- wow! I’ve been posting so much less because I’m finishing up work on the book A Year of No Sugar, so stay tuned! The idea is to make “jam” using chia seeds – since they thicken up most mixtures. So the basic idea is to use chia seeds to thicken up a fruit/berry puree. *it’s too good an idea to not share it. *The idea is to make “jam” using chia seeds, which thicken most mixtures. Essentially, you combine chia seeds and a fruit/berry puree to make a thick and gluggy jam. You are currently reading A Year Of No Sugar: Postscript 12 at Eve O. Schaub.